We'll have a Heart Month wrap-up on here soon, but we wanted to take a minute to recognize everyone at Strong Films. In November of 2011 Mike Schmidt from Arnold Palmer Hospital reached out to us, asking if we'd allow Holden's story to become the feature of a short for the hospital. We agreed, and Mike immediately set up a meeting with the film's director, Jon. On a wet November Saturday, a beard friendly Jon Strong came skipping into our driveway on the back of a Vespa. For an hour, he threw a calliope of questions our way. Filming began in January of 2012. Holden's surgery wasn't part of the original plan. If you'll recall, Holden's first surgery was scheduled for a Friday. We found out he'd be going under the knife two days before that. Jon was supposed to meet us that weekend to film various auxiliary scenes for the film. I called him Thursday cancelling, explaining why I had to delay his work. He paused and asked, "If I can get permission, do you mind if I film the surgery?" I didn't really pause all that long, "Sure, why not?" I won't lie, my focus wasn't on Jon's question. I was so windblown blown the surgery, he probably could have tricked me into signing the deed to my house over to him at that time. Jon text me that night saying he was still waiting to hear from the doctor. I didn't hear from him again until the next morning. And when I say morning I mean like 5 AM, riding to the hospital, chugging coffee to fight anxiety. Jon had beaten us to the hospital, and was ready to film. We arrived, met Jon and his friend Chris and they started filming immediately. We really don't remember the cameras. The perfect cocktail of anxiety, a complete lack of sleep, and caffeine will do that to you.The Tin Man was released on March 31, 2012. When Jon described his vision of the film to us, we had no clue it would come out the way did. To say it exceeded our expectations is an understatement. In many ways Jon gave us a totally new point of view on our own story. I know other people felt the same way. In November The Tin Man won a marketing award for Arnold Palmer Hospital. 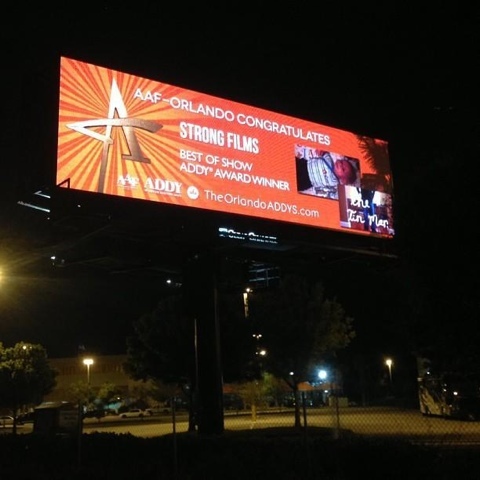 A few weeks ago it netted Strong Films the prestigious "Best in Show" at the Orlando ADDY Awards. Congratulations to Strong Films, your hard work has paid off, and will continue to reward you. Thank you for letting us be a part of your success. We were proud to be invited to the American Heart Association's Heart Ball last night. Holden hammed it up enough to make his appearance known. We gave him the ol' Serge A. Storms look for "Safari Night" too. Special Thanks to everyone at the American Heart Association for their continued work in the CHD community.